They often hunt in deep, very cold water with temperatures well below zero degrees Celsius. To stop their blood literally freezing (a genuine danger!) 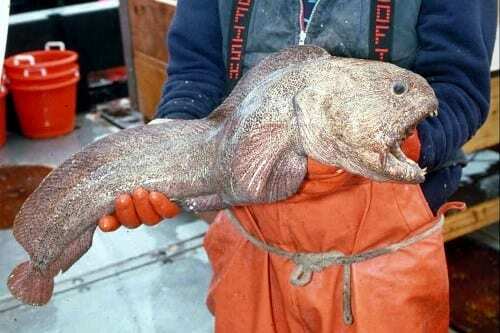 wolffish produce a molecule known as type iii antifreeze protein. This compound circulates in the fish’s blood, blocking the formation of ice crystals by binding to their surface. 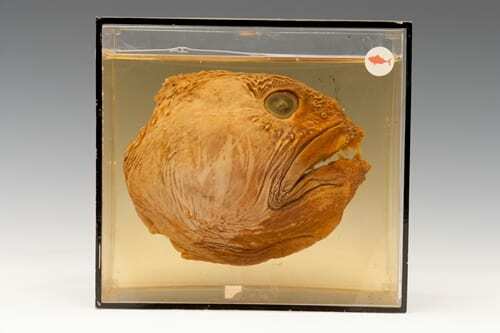 Bering wolffish. Image in the public domain. This has declined significantly (there are far fewer to catch!) to a mere 15,044 tonnes (in 2011). Still a staggering figure and even crazier given that the vast majority are caught “accidentally”. That’s not to say wolffish aren’t eaten, but they aren’t commonly eaten and so aren’t commonly targeted. Bottom trawling, which commercial fishing now relies on, cannot discriminate between fish you want and fish you don’t. If it’s in the net you catch it though bycatch, the technical term for “got stuck in the net”, isn’t the only problem. 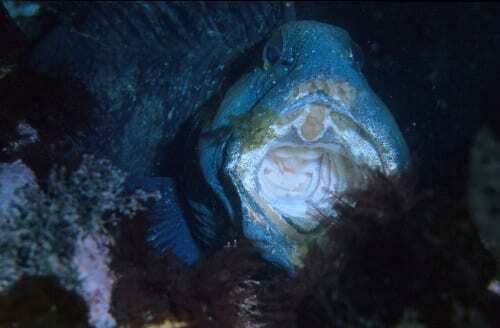 Wolffish need stable, healthy sea beds to survive. Trawler nets are big and heavy. They can weigh tonnes and are dragged for miles along the bottom. This destroys coral, rips up boulders and stirs up any toxic chemicals that were safely buried in the sediment. Wolffish populations have declined by as much as 96% in some areas. Mariève Desjardins, Nathalie R. Le François, Garth L. Fletcher, Pierre U. Blier, High antifreeze protein levels in wolffish (Anarhichas lupus) make them an ideal candidate for culture in cold, potentially ice laden waters, In Aquaculture, Volume 272, Issues 1–4, 2007, Pages 667-674, ISSN 0044-8486, https://doi.org/10.1016/j.aquaculture.2007.08.016.